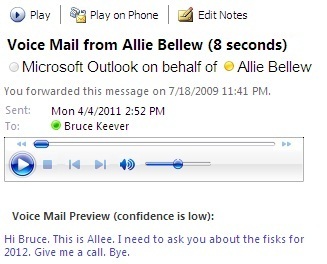 Voice Mail Preview provides a speech to text transcript of voice mail messages that you receive. Note: This feature requires a Microsoft Exchange Server 2010 account. Unified Messaging must be enabled by your Exchange administrator. Note: The voice mail options found in Microsoft Outlook 2010 are also available in Outlook Web App (OWA). Note: After your Web browser opens, you are prompted for your login credentials for OWA. Under Voice Mail Preview, select or clear the Include preview text with voice messages I receive or Include preview text with voice messages I send through Outlook Voice Access check boxes. This feature requires you to use a Microsoft Exchange Server 2007 account. Most home and personal accounts do not use Microsoft Exchange. For more information about Microsoft Exchange accounts and how to determine which version of Exchange your account connects to, see the links in the See Also section. Your Exchange 2007 administrator must enable the Unified Messaging feature for these commands to be available. You can configure multiple voice mail options. These options include resetting a Microsoft Office Outlook Voice Access PIN, voice mail greetings, and missed call notifications. Missed call notifications are enabled by default. At any time, you can turn on or off the missed call notification messages that are sent to your Inbox. Note: The voice mail options found in Microsoft Office Outlook 2007 are also available in Microsoft Office 2007 Outlook Web Access. Select the Send an e-mail message to my Inbox when I miss a phone call check box. Clear the Send an e-mail message to my Inbox when I miss a phone call check box.